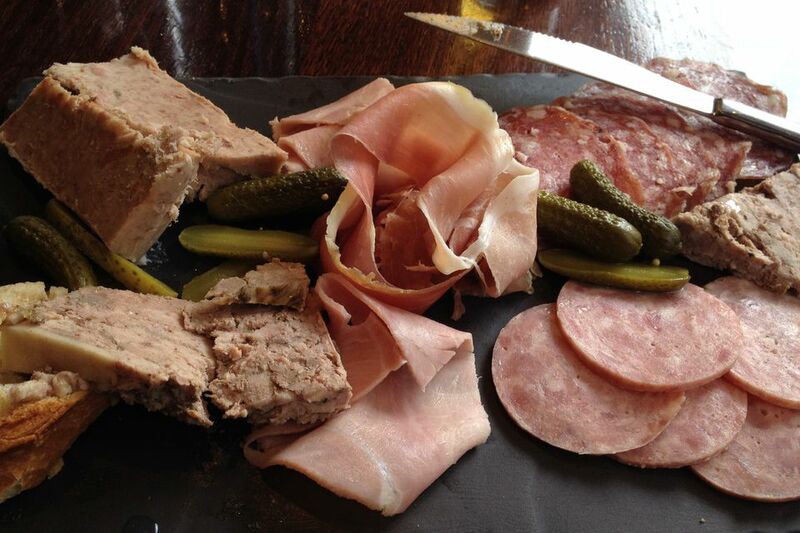 Many meat items on a charcuterie plate are extremely rich, salty, or both and without a decent-sized piece of cornichon in each bite, your palate would swiftly be overwhelmed. You don't have to mix your flavors, though. Cornichons are delicious all by themselves! You can grow your own cornichons, which are smaller and a bit sweeter than a conventional pickling cucumber. Check out your high-end nursery or herb seller—ask for French cucumbers, Parisian cucumbers, or Parisian gherkins. Online, look for retailers who specialize in heirloom crops. Buy the actual cornichons if you can; English cucumbers are not a good substitute in that they lack that little bit of tartness that distinguishes a cornichon. You can also buy already brined or processed cornichons in the pickle aisle of high-end groceries like Wegman's. If you still absolutely cannot find cornichons, purchase kosher dill pickles and, with an extremely sharp knife, slice them width-wise. Remember, you're looking for taste rather than looks. Cornichons are made by starting with a particular variety of gherkin that is smaller than the ones you usually buy at the supermarket, and picking them when quite young so that they're only an inch or two long. After curing them in salt overnight, which helps draw out some of the liquid, the gherkins are immersed in vinegar overnight again. The vinegar is brought to a simmer, then cooled, and the gherkins and the vinegar are sealed into jars along with herbs and aromatics such as tarragon, cloves, bay leaves, thyme, and pearl onions. There are other curing methods that don't involve simmering the gherkins but use the same ingredients and the result is a firmer, crisper cornichon. Many recipes incorporate chopped cornichons, including beef stroganoff and steak tartare, as well as various cold salads such as egg salad or potato salad. Charcutière sauce is a classic sauce made by sautéeing minced onion in butter or lard, then adding vinegar and demi-glace, reducing and then finishing with julienned cornichons. Gribiche sauce is a cold sauce made with a base of mashed boiled egg yolk mixed with oil and vinegar, similar to the way mayonnaise is made, only using boiled egg yolk rather than raw. The egg whites are julienned and then mixed into the final sauce, which is served with lobster and crawfish.